What is neccessary to prepare? We put leaven into a vessel, add water and mix it a little with a wooden spatula. Next, we add flour and other ingredients. Rye flour is sticky and it is difficult to mix, therefore we help the blades with a spatula. If we have enough time, we let the dough rise for about 2 – 2 ½ hours, at 27 – 30 °C. After the first rising phase we mix it for about 3 minutes again and then we remove the blades. The dough aerates more and rises better then. The second rising phase should be set for 3 – 4 hours and then baking follows. If we do not interrupt rising with the second mixing, we let the dough rise for about 6 hours at 27 – 30 °C. According to the results, you can adjust temperatures, times or the amount of leaven. Baking is always the same. First we bake the bread for about 15 minutes at 160°C and next 1 ½ hour at 130 – 140 °C. It´s easy to prepare tasty bread full of nutritions inside. Pour water into the baking bread pan. Than add home yeast, flour, cumin, salt and oil. Set up your bread maker according the video tutorial and start programme. After kneading remove kneading paddles, add seeds and cover the pan with glass lids. 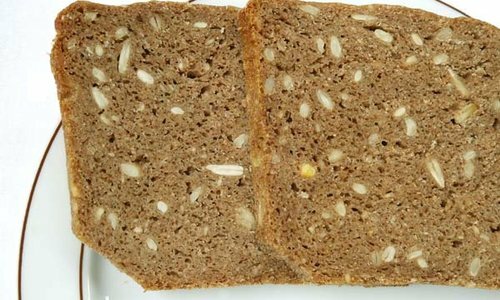 Healthy whole grain bread? Not in the supermarket. Just because it is dark does not mean it is healthy. If you decide to make the healthy switch to whole grain bread, but do not bake your own, get ready for a long drive. We had to go 45km to find true whole grain bread, and what we found was disappointing. If you thought that loaf of bread you just bought in the store is made with only flour, yeast, water, salt, and oil, think again. Store-bought bread is like a chemical laboratory, made with ingredients like acidity regulators, leavening agents, emulsifiers, enzymes ... as many as thirty ingredients. Do you search something conrete? Have you ever heard about Sana Bread Maker? We were working on Sana Bread Maker more than 20 years! Do you want to know more about Sana brand? Many people use traditional home yeast and you could get it from these! Made in: INSPIRE CZ s.r.o.